One popular thing to do on Facebook is upload pictures of events and places. Your Nexus has this capability, and it’s something that the Facebook app can do, but not completely because the Nexus 7 lacks a rear-facing camera. And having a front-facing camera makes no difference, either: If you attempt to take a picture of yourself using the Facebook app, you’re informed that your tablet lacks a camera. Choose an option from the Upload Photo menu. Because the Nexus 7 lacks a rear-facing camera, the Camera app starts and then fails. You see a prompt on the screen. Touch the Photo button, or if you have videos stored on your tablet, you can choose the Video button. The Gallery app starts, from which you can browse for and choose a picture to upload. You can touch someone’s face in the picture and then type their name. Choose from a list of your Facebook friends to apply a name tag to the image. Touch the check mark to confirm any tags. Type some text to accompany the image. No, until something changes, this method is not effective for uploading images to Facebook. Those fits and starts you experience when you make the attempt to upload an image are what people in the computer-nerd industry call bugs. Not every image stored in the Gallery can be uploaded to Facebook. Shared Picasa albums, for example, cannot be chosen for uploading to Facebook. You see the message No permission to access media if you make the attempt. 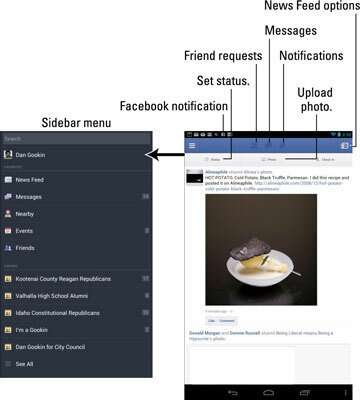 Facebook also appears on the various Share menus you find on the Nexus 7. Choose Facebook from the Share menu to send to Facebook whatever it is you’re looking at.